One of the tasks in our Baltibrew Yeast Capture project was to search through historical texts about Baltimore's brewing history to try and locate a Baltimore specific beer recipe. Unfortunately we struck out on the recipe but our investigation led to this happy little byproduct. Presenting a map overlay of pre-prohibition Baltimore Breweries! If you've ever wondered who was making beer in your neck of the woods before the 18th amendment this overlay will give you a little window into the brewing history in your neighborhood! Notes: Data taken from William Kelley's 1965 book, Brewing in Maryland. Overlay focuses on breweries founded before 1900. Most of these breweries changed owners and name several times before closing. Brewer listed corresponds to the original proprietor. Address are approximate and list is certainly incomplete. The page of first mention is included in the overlay card for each point. Source text is available in the Maryland Room of the main branch of the Enoch Pratt Free Library. Back when we started our journey to wrangle some wild local microorganisms the biggest question we faced was not if we could capture yeast, but if we could capture yeast that would make beer. Now we find ourselves at a crucial juncture. We need to measure the attenuative properties of our yeast isolates to determine if any of the samples can ferment the more complex sugars in a malt based wort. Yeast is everywhere in nature, living in places like flowers, fruit, and tree bark. It grows by converting sugars into the energy it needs to multiply, producing ethanol as one of its coveted byproducts. All yeast can consume simple sugars like sucrose, glucose, and fructose. Over the centuries many cultures developed rich traditions of fermented food and beverage. Before humans discovered the organisms responsible and assigned them names, people had already modified these lifeforms by reusing material from pleasing results. 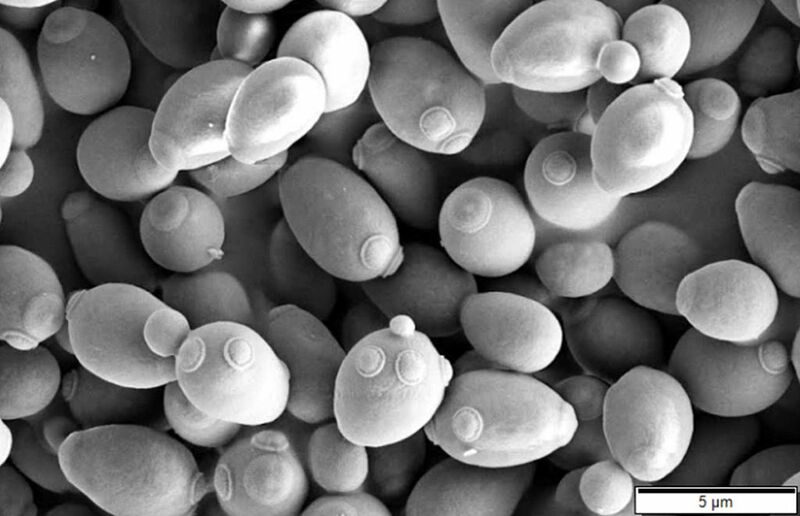 Brewers yeast, with its ability to ferment the maltose that makes up the majority of wort sugars, has been under heavy selection pressure throughout the course of human history. 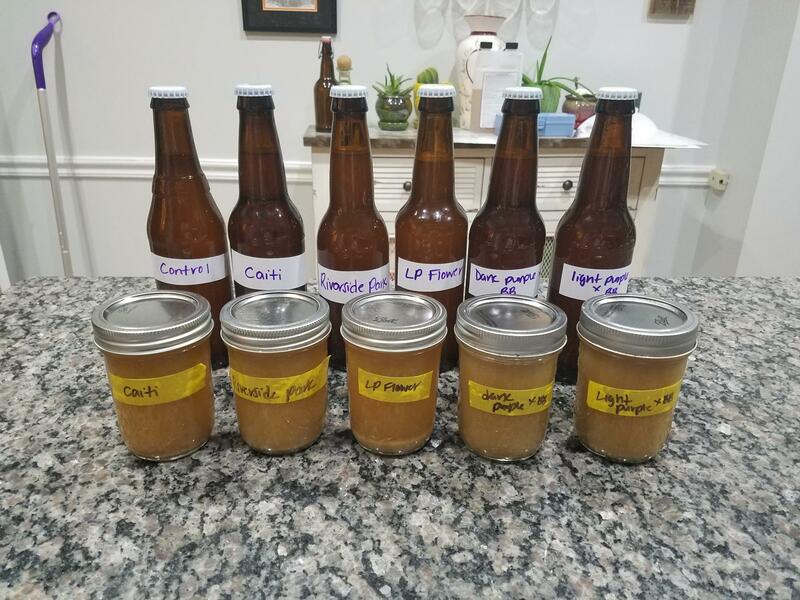 The packs of dried and liquid yeast available to modern homebrewers are the culmination of years of brewing study and science. We are fortunate to be able to choose from a variety of proven yeast strains (and other organisms) when crafting our recipes. The beers produced from this panel would have no such advantage. Our project began in April when we prepared and distributed capture kits to our members. In June, we triaged the results and jumped into the lab to plate and examine the captured organisms. Baltibrewer Becky set to work this July, isolating and culturing up quantities of 6 strains of budding yeast. We decided the quickest way to find out what we had was conduct to a survey of 1 quart samples. The finished fermentations would be checked for specific gravity and pH drops. If any results were pleasing we’d bottle a 12 ounce sample. Yeast cakes would be saved for future use in larger batches. Becky stepped up the cultures in the lab over the course of a few weeks and tested the samples for purity. On August 9th we met up with our yeast for a brewday! For simplicity, we used Briess Light Dry Malt Extract and distilled water for our wort. We added a single charge of UK Sovereign hops for a bittering addition at 30 minutes. While the wort chilled we sanitized jars and airlocks. Given the lack of headspace in our tiny fermenters we added a few drops of Ferm-Cap-S as we portioned the wort 7 ways (one extra jar for a US-05 control). We pitched our samples and to our pleasure within a day or two we were off to the races! Some jars showed more vigorous activity than others. We observed action in the airlocks of most. Given the homemade nature of our airlock fixture it was certainly possible our seals were not perfect. We decide to wait at least 2 weeks before checking the results. On August 29th, we gathered to investigate. Getting down to the business of bottling. We processed the beers one at time. A single jar was briefly opened and a sanitized pipette used to remove liquid for a Brix reading. After we assed attenuation, we moved on to a quick smell evaluation. Any interesting results were bottled and the finished pH noted. The rest of the sample would be transferred a smaller container and stored cold. It was time! What would we find! To our amazement, 5 of 6 samples showed a significant drop in gravity and pH! The threat of commercial contamination loomed in our heads as we recorded tasting notes from the uncarbonated beer. To our pallets the cultures produced distinct flavor profiles in the fermented products, some quite notable! 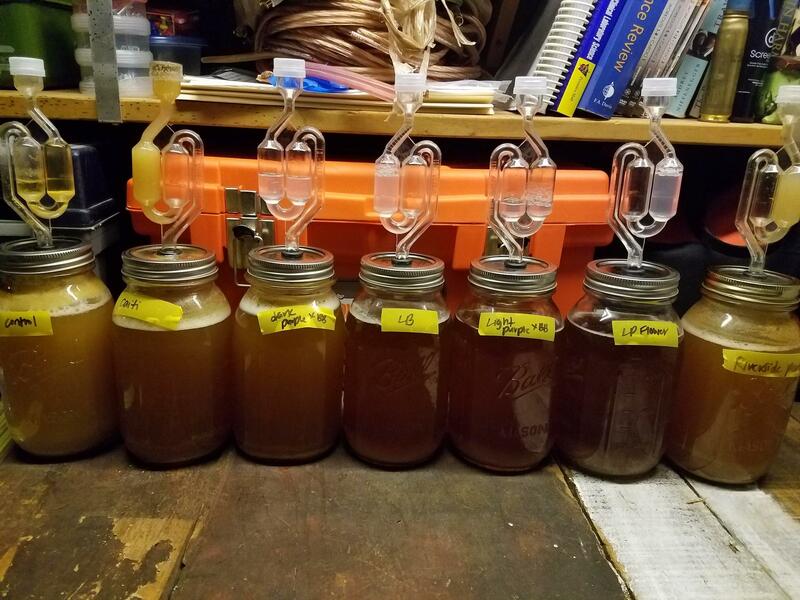 Between the variety of results, the different levels of activity and flocculation, and the fact that one culture did not attenuate well at all, we’re very hopeful these fermented beers represent true isolates from wild captures and our coolship barrels! We buzzed with excitement as we cleaned, dreaming of things we could do with the saved samples! But as we looked to the future, we also reflected on the road to this point. Capturing this many strains of yeast that could complete a fermentation was somewhat unexpected. How did we end up here? Was our capture medium with its low OG, IBU, and pH a sufficient filter for the small amount of malt friendly yeast to take hold? 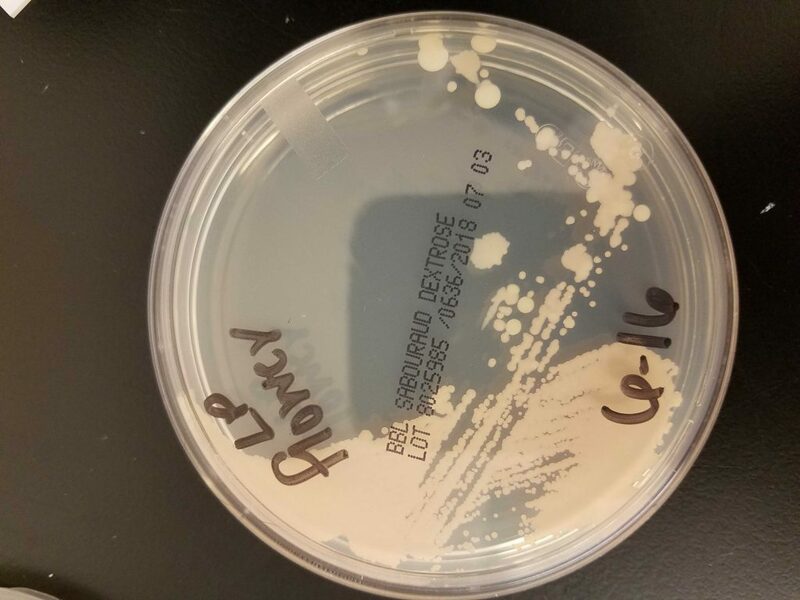 Did the large number of initial captures followed by aggressive triage of moldy and failed samples set us up for a better success rate once we got into the lab? Were our expectations set too low to begin with? We’ll continue to reflect on the project as we wait to taste the carbonated samples at our next meeting. With fall on the horizon we are eager to continue our quest to make beers with native strains of Baltimore yeast. Cheers and happy homebrewing! 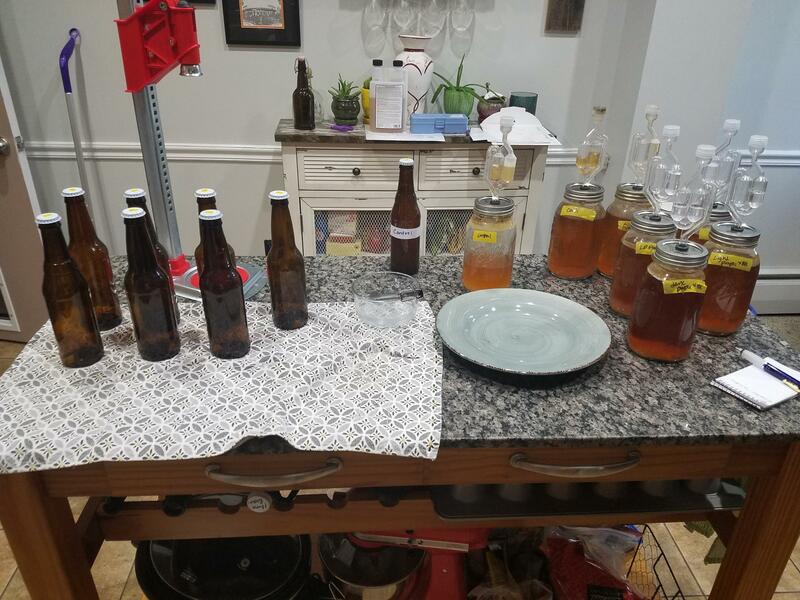 A big milestone in our project: bottled beer and saved yeast from successful fermentations. In April we distributed homemade yeast capture kits to the club at our monthly meeting. Our goal? 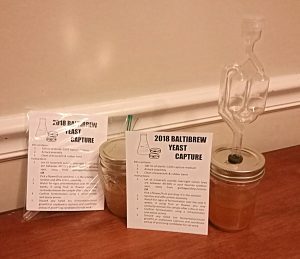 To capture and isolate a strain of yeast native to Baltimore and use it to make a fermented beverage! Members were eager to try their luck. The weather was poised to cooperate. Lows would bounce between 40 & 50 F for the next few weeks, a range said to be helpful when harvesting wild yeasts. Things were looking up as we grabbed flowers from our backyards & local parks, swabbed out barrels used for coolshipped wort, or left our covered jars tucked safety outside. All that was left for us to do was to sit back and wait for the airlocks to start bubbling. So we waited! Several members saw no activity at all. Others observed growth of mold or other non-yeast organisms. We found it interesting that two samples did not register a gravity drop. 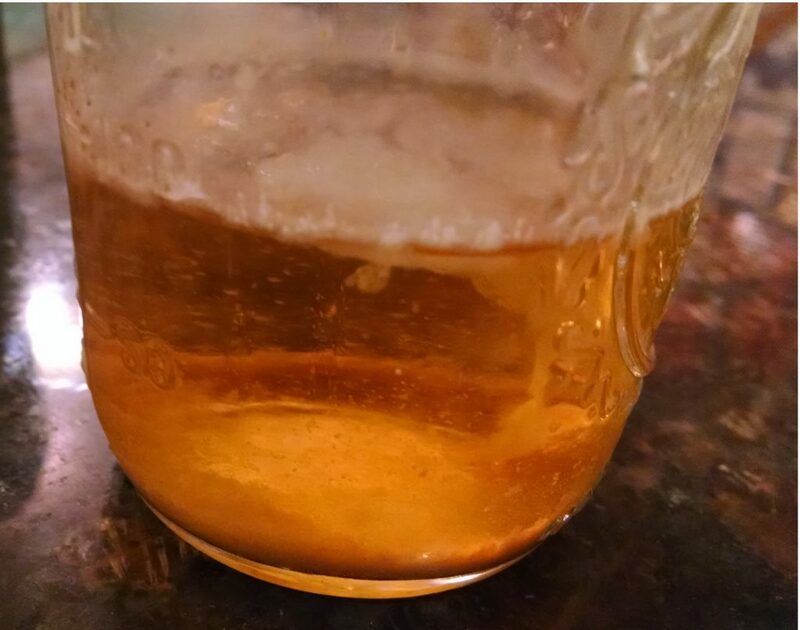 They both showed airlock activity, became turbid, and accumulated a layer of sediment on the bottom as activity slowed. Did we incorrectly measure the first Brix reading? Was there really no decrease in gravity? Cultures taken from the samples would tell us more. One drop of medium was transferred to individual Sabouraud Dextrose (Sab) plates. Plates were streaked for isolation and incubated in the dark at room temperature (approximately 68 degrees F). Within days they showed abundant growth. While the yeast strains are isolated and grown up, it's worth considering what we've accomplished and where we might go from here. The original plan was to isolate native organisms for use in a malt based fermented beverage. 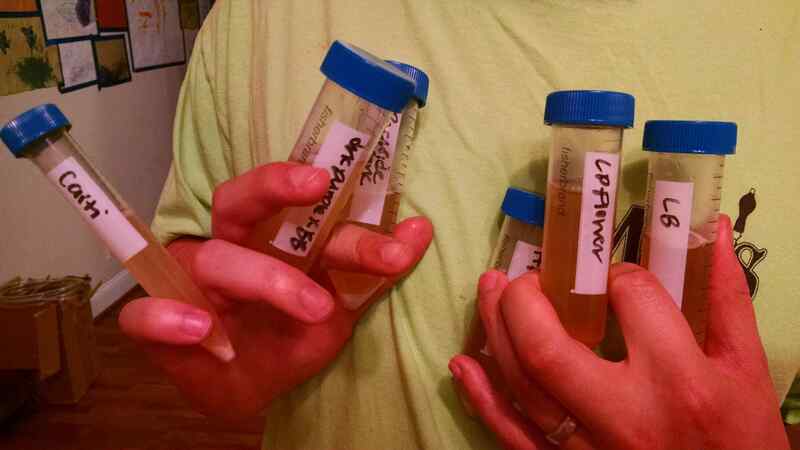 We now have at least 2 wild Baltimore yeasts on our plates and 3 more selected from barrels used after coolshipping. Two showed at least moderate attenuative properties in the capture media. Several did not. Trials will tell us more but it is fair to suspect that these yeasts may not do well fermenting a malt based wort on their own. So is our plan still viable? Michael Tonsmeire of The Mad Fermentationist blog and Sapwood Cellars (opening soon) stopped by our June meeting to share funky beers and talk about his brewing philosophies. One topic he spoke on was recognizing and embracing your individual strengths and scales. As homebrewers it can be hard to make an Octoberfest that nails the style as well as commercial brewers. They have first pick of malts, laboratories to grow up strong & pure pitches of yeast, rigorous fermentation & packaging controls, and employees devoted entirely to quality control & sensory evaluation. On the other hand we are not beholden to the demands of bulk production. This affords us flexibility. For example, we can experiment with secondary additions from local crops, using fruits that aren't grown in large enough quantities to be an option for commercial offerings. 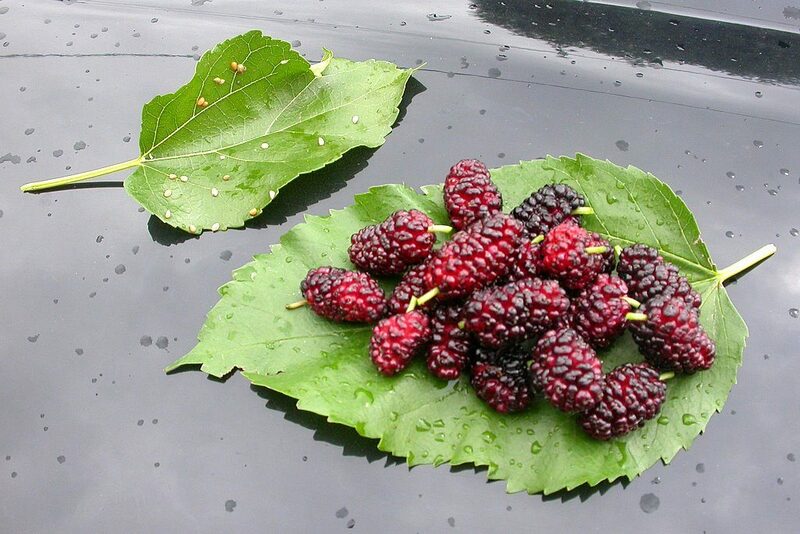 Just last month Mulberry Trees in our area started to yield ripe fruit. For anyone not familiar the mulberry is a delicious, mildly sweet & jammy tasting fruit that looks a lot like a blackberry. Perhaps we won't end up with a yeast that can make a beer. But perhaps we will end up with several capable of producing local fruit wines and ciders! We will stick to our strengths as homebrewers and stay nimble. Cheers and happy brewing! 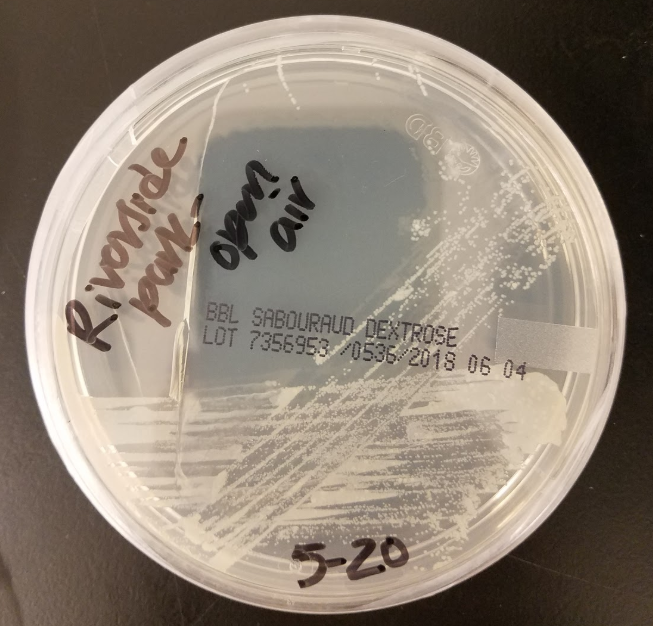 Read more as we take our isolates out of the lab for a test drive! Baltibrew members hail from a wide range of professional backgrounds, from the service sector to the arts to engineering and finance. Among our ranks are several bonafide microbiologists. Drawing on their expertese, the club has embarked on a challenging and multi-part project for the year: we're going to try to capture, isolate, culture, and evaluate a Baltimore native brewers yeast! Finished capture kit for club members. 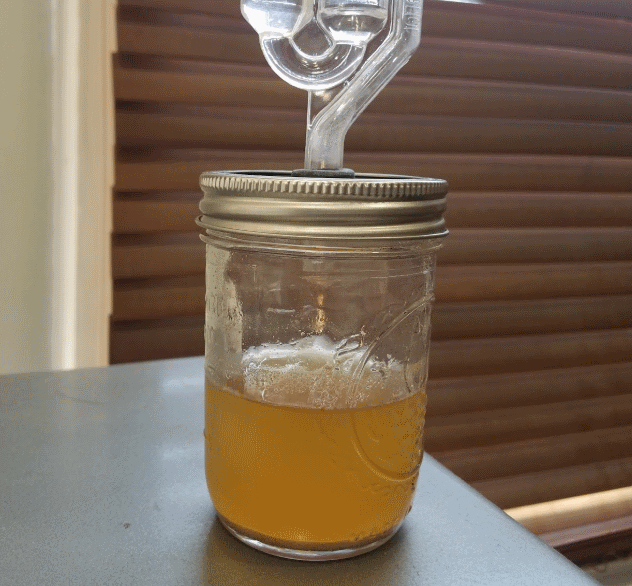 While a number of our brewers produce tasty beverages via spontaneous and mixed fermentation, there are a several challenges in an attempt to isolate a strain of yeast for brewing purposes. Capturing anything interesting at all! Leaving our capture media outside doesn't guarantee we'll end up catching something that will ferment instead of just spoil. We'll be casting as large as net as we can in the hopes of finding candidate organisms. Capturing something that will ferment strongly on its own. In a mixed fermentation, the processing of various sugars into ethanol and other compounds is a team game. 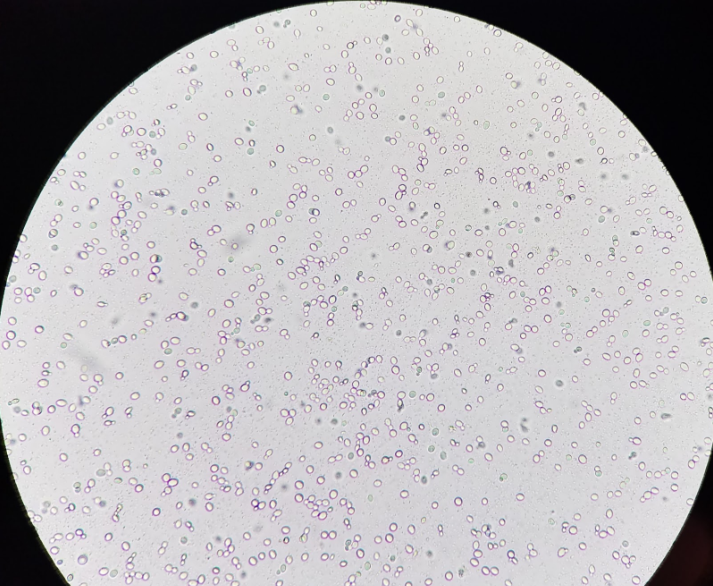 We're looking to isolate a strain of yeast that can do the job itself and there's no assurances that the yeasts we might capture will be able to tackle the simple and more complex sugars found in wort. After we've selected candidates from our captures, we'll need to test them to see if they are up to the job. Capturing something that is not the Chico strain. We're brewers and we're surrounded by brewing yeast! It's in our homebrew. It's likely floating around our houses. We'll need to take care that we don't end up "capturing" an organism that we've brought into our local environment. Capturing something that makes a pleasing beer. And here's the big question. Even if we capture and isolate a yeast or yeasts that are up for the job, there's no way of telling if they'll make a pleasing product. After all, brewers yeasts has been living with humans for a very, very long time and have been heavily subjected to selection pressure. People have been knowingly (and unknowingly) changing the organism by reusing pleasing results, selecting for attenuation, floculattion, expediency, and taste. If we are successful in wrangling a pure strain of yeast that will ferment a wort of malted barley, are we lucky enough that it should make a tasty brew? After discussing the challenges, we set about designing a simple protocol and capture media to distribute to club members at our April meeting, with the intention of collecting promising candidates at the next. 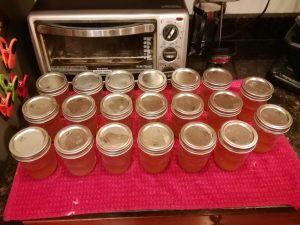 We prepared and processed the capture media into 8 oz mason jars. Starting with 1 liter of distilled water and 143 grams of DME, we calibrated a pH meter and added enough lactic acid (~.5 mL) to drop the solution below 4.50 pH. The wort ended up at 1.025 SG (as converted from a Brix reading of 6.4) and a pH of 4.38. We processed 20 jars filled with 100mL of the media and half of a hop pellet each in a pressure canner at 15 PSI for 15 minutes. 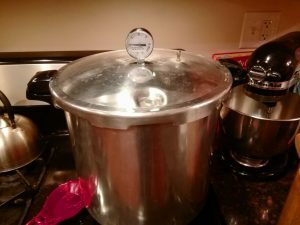 While the canner ran, we crafted airlocks from extra mason jar lids, rubber grommets, and S-type airlocks. The goal here was to provide a members with a simple way to limit oxygen exposure after capture, hopefully keeping some of the less favorable aerobic organisms in check. 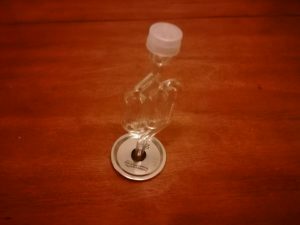 Airlock lid for after capture. The capture media, modified lid and airlock, clean cheesecloth, and a protocol sheet were bundled into a capture kit for members to take home. Members may choose how to conduct their capture; either directly from a biologic sample like a flower or fruit, or from the outside air itself. Admittedly, the odds are low but the fun is be in the attempt. Read more as we take our captures into the lab!